Having a commercial water heater installed into your building is a complicated task with a lot of moving parts. There’s the purchase of the heater, the scheduling of the installation, the preparation, and so much more. At any given point throughout this process, a lot can go wrong, throwing the entire project off track. Let Front Range HVAC do the heavy lifting for you by providing an expert commercial water heater installation that you won’t have to worry about. 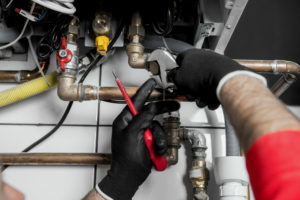 Our team is well-versed in every aspect of water heater installation, from work area preparation to final commissioning. We can prove our expertise with our long list of satisfied customers built up over the past 20 years of doing business in the state of Colorado. However, you define quality, Front Range HVAC sets the standard for excellence with every commercial water heater installation project we take on. We know that our success hinges on the accurate, timely, and cost-effective installation of your commercial water heater. That’s why we pay extra attention to detail throughout the entire process. Commercial water heaters are very sophisticated, highly intricate pieces of industrial equipment. There’s a lot to know about how to install one, and not every HVAC company has the trained personnel required to get the job done right. At Front Range HVAC, we invest heavily into the skills that our technicians need to do their jobs better than the competition, at a reasonable price and within a timeframe that won’t cause unnecessary downtime for your tenants. We know that you have a choice when it comes to selecting the service provider for your commercial water heater installation. That’s why we go above and beyond to exceed expectations, resulting in a successful installation that delivers years of performance from your new commercial water heater. To inquire about having your new commercial water heater installed at a date and time that works best for you, contact Front Range HVAC by calling (303) 942-1372.